In a failover plan, you set the order in which VMs must be processed and time delays for VMs. The time delay is an interval of time for which Veeam Backup & Replication must wait before starting the failover operation for the next VM in the list. It helps to ensure that some VMs, such as a DNS server, are already running at the time the dependent VMs start. The time delay is set for every VM in the failover plan except the last VM in the list. The failover plan must be created in advance. In case the primary VM group goes offline, you can start the corresponding failover plan manually. When you start the procedure, you can choose to fail over to the latest state or select the point in time to which VM replicas must be started. Veeam Backup & Replication will look for the closest restore points to this point in time and use them to start VM replicas. For each VM, Veeam Backup & Replication detects its replica. The VMs whose replicas are already in Failover or Failback state are skipped from processing. 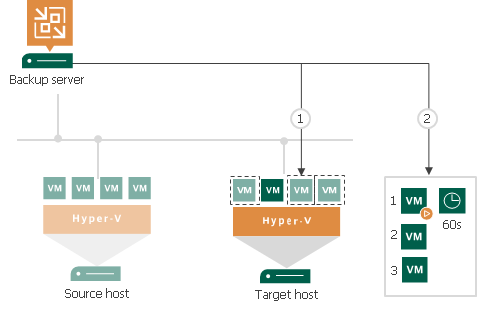 The replica VMs are started in the order they appear in the failover plan within the set time intervals. The maximum number of VMs that can be started simultaneously when you run a failover plan is 10. If you have added more VMs to the failover plan and scheduled them to start simultaneously, Veeam Backup & Replication will wait for the first VMs in the list to fail over and then start the failover operation for subsequent VMs. This limitation helps reduce the workload on the production infrastructure and backup server. For example, if you have added 14 VMs to the failover plan and scheduled them to start at the same time, Veeam Backup & Replication will start the failover operation for the first 10 VMs in the list. After the 1st VM is processed, Veeam Backup & Replication will start the failover operation for the 11th VM in the list, then for the 12th VM and so on. Failover is a temporary intermediate step that needs to be finalized. The finalizing options for a group failover are similar to a regular failover: undoing failover, permanent failover or failback. If you decide to commit failover or failback, you need to process every VM individually. Although you can undo failover for the whole group using the undo failover plan option. Undoing the failover switches the replica back to the primary VM discarding all changes that were made to the replica while it was running. When you undo group failover, Veeam Backup & Replication uses the list of VMs that were failed over during the last failover plan session and switches them back to the primary VMs. If some of the VMs were already failed back, for example manually by the user, they are skipped from processing. Veeam Backup & Replication starts the undo failover operation for a group of 5 VMs at the same time. The time interval between the operation starts is 10 seconds. For example, if you have added 10 VMs to the failover plan, Veeam Backup & Replication will undo failover for the first 5 VMs in the list, then will wait for 10 seconds and undo failover for the remaining 5 VMs in the list. Time intervals between the operation starts help Veeam Backup & Replication reduce the workload on the production environment and backup server.